Born and educated in China, Ha Jin completed post graduate studies in the US and has made a career of writing about China in English. I read his A Map of Betrayal a while ago, and came to the conclusion that the plentiful awards this writer has won, are more in sympathy with his relentlessly anti-Chinese position than for his skill in writing. I found aspects of A Map of Betrayal unconvincing, and The Boat Rocker similarly flawed. 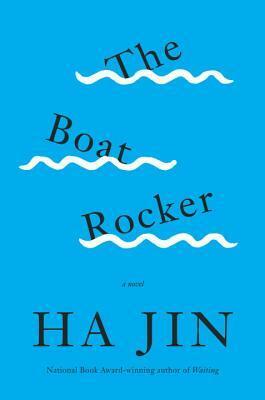 The occasional awkwardness of Ha Jin’s writing is signalled by the title. I don’t think I’ve ever heard a native speaker of English call someone who ‘rocks the boat’, a ‘boat rocker’. It sounds wrong, IMO, and a misuse of an idiomatic expression, though I’d have to concede that maybe American usage is different. But the author’s style is generally very plain and ordinary, and it’s not IMO salvaged by occasional florid passages describing food or clothes. But the main problem with this book is its absurd plot. Feng Danlin is a US-based hack journalist who writes about Chinese issues for the local Chinese community, hoping that his work will be syndicated to other journals both American and international (including China). One day he is assigned the task of unravelling the strange promotion of his ex-wife’s book by Chinese authorities, who have made extravagant claims about its merits. His boss dismisses any concerns about there being a conflict of interest in Danlin attacking Yan Haili, and he is only too pleased to be able to smear her reputation, sabotage her relationship with her new husband and enjoy the inevitable sexist and offensive trolling that arises, glossing his relentless pursuit of her in his columns with the argument that journalists must seek out the truth. None of this is the slightest bit convincing, but it soon becomes apparent that this novel is a vehicle for Ha Jin to expose the corruption of the press in China, its plans to infiltrate the free press in the US, and American complicity in not ‘rocking the boat’ for their own realpolitik purposes. Danlin’s lofty tone as he lectures the reader doesn’t compensate for the lack of sophistication in his argument, and his position is irretrievably compromised by the fact that he’s taking his revenge on his wife. Many readers at Goodreads seem to think highly of this novel, and Jeffrey Wasserstrom at the NY Times was impressed by its savage satire. But I’m not impressed at all. All I can say is that I really love his novel Waiting. It was a really fascinating story though I know some found all the waiting way too slow! It successfully, I thought at the time but it was a LONG time ago, successfully married the political and the personal. I think I have his short story collection the bridegroom in my TBR but I have a feeling I may never get to it. Oh dear. I’ve got it somewhere, I think I may have bought it on my Kindle very early on, and I just forget about books on the Kindle because they don’t assert themselves like real books do. Ha Lisa, that’s true. I have a TBR folder on my Kindle to try to keep me honest ! Doesn’t work wonderfully well, but at present it is only about 28. Rod Stewart singing ‘Sailing’, now that’s a boat rocker! PS Are you in Melbourne now? Tomorrow afternoon, for a week. Will email. Looks like you enjoyed your celebrations (you were a fine bride). Congratulations!